In late 1840s the young swedish immigrant in USA John William Nystrom, who lived in Philadelphia, invented a calculating device, which was presented and received a First Premium at the Franklin Institute Exhibition in 1849. Later Nystrom received a patent for his calculating machine (US patent №7961, March 4, 1851). 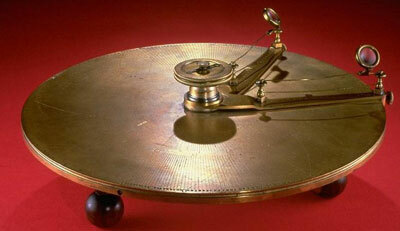 In an article of Scientific American the device was hailed as the most important one ever brought before the public. Despite all of the accolades however, it was never widely accepted, and no more than 100 devices were ever produced. This may have been because the cost (there were $10, $15, and $20 models, a huge sum in 1850s), or because the instrument was never well advertised or marketed. John Nystrom (1824-1885), born in Småland province, Sweden, as Johan Vilhelm Nyström, was a Swedish-American civil engineer, author of many books and inventions besides the above mentioned calculator, such as a marine steam engine, a refrigerator, a hydraulic pontoon-dock and others. After receiving his engineering degree from the Royal Technological Institute in Stockholm, in the beginning of 1840s he emigrated to US (he became a US citizen in 1854) and settled in Philadelphia, embarking on a career primarily focused on nautical engineering and steam vessels. The complicated and repetitive calculations required for propeller and propulsion designs evolved into the development of his calculating device. In 1859 Nystrom proposed a hexadecimal (base 16) system of notation, arithmetic, and metrology called the Tonal System. The system was described in a book from 1862 and in addition to new weights and measures, his proposal included a new calendar with sixteen months, a new system of coinage, and a hexadecimal clock with sixteen hours in a day. 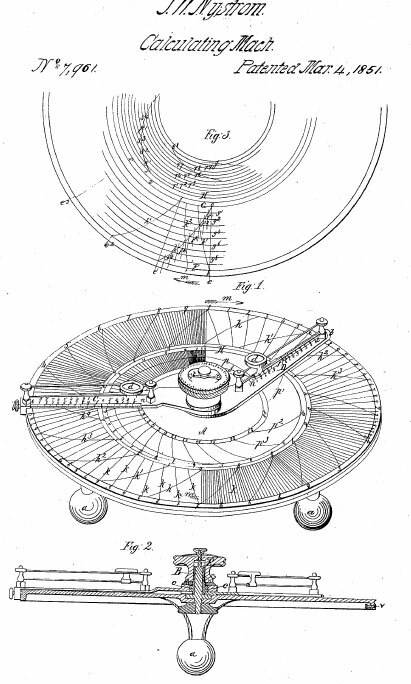 The device (see the lower drawing) was a circular slide rule/calculator, based on logarithms, but promoted for use in addition and subtraction as well as multiplication and division. It was manufactured in Philadelphia by William J. Young, one of the most prolific American instrument makers in the 19th century, and by other manufacturers, like George Thorsted in New York, and advertised in 1850s as the merchant will find this calculating machine to be all they desire. The device consists of a silvered brass plate of about nine inches in diameter, on which are fixed two movable arms, extending from the centre to the periphery. On the plate are engraved a number of curved lines in such form and divisions that with their intersection with the arms, the most complicated calculations can be performed almost instantly. There is also a detailed description of the device in a 42-pages book from 1854 (see description of Nystrom's Calculator). Nystrom became an assistant Secretary and Chief Engineer of the US Navy during the Civil War. He also spent a number of years abroad, advising both Russian (in the end of 1850s he was appointed as engineer in chief to the Volga-Don Railway and Don-Azoph Steam Navigation Company, Consulting Engineer to the Russian Steam Navigation and Trading, and designed a pontoone-doc in S. Petersburg) and Peruvian governments on their operation and deployment of steam ships. Later on, he returned to the US and spent his remaining years in Philadelphia, been quite active in the affairs of Franklin Institute. He died in Philadelphia in 1885, at the age of 61.